Celebrate Halloween with this ghoulishly delicious punch. Made with JELL-O and KOOL-AID, it's perfect for little goblins. Prepare jelly mixes as directed on package. Refrigerate 4 hours or until firm. Break jelly into small flakes with fork. Spoon about 1/2 cup jelly into each of eight tall glasses. Pour 1/2 cup prepared drink over jelly in each glass. Prepare 1 pkg. (85 g) each Jell-O Grape and Orange Jelly Powder as directed on package. Refrigerate until firm, then break into flakes. Alternately layer 1/4 cup each orange and grape jelly flakes in each glass. 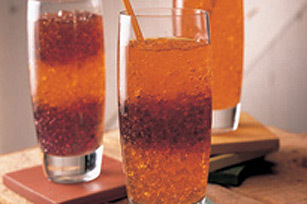 Pour 1/2 cup cold prepared drink over jelly in each glass. Prepare Kool-Aid as directed, substituting cold soda for the water. Serve immediately.